« Trace a simple pattern in pencil on one side. « Punch out your design with a hole punch. « Sink a votive candle or tea light in the center. « Place the luminaries along a walk, patio, or deck. « Have a grown-up light them and then bask in the glow. 1. Clean milk gallons and remove all labels. 2. On the side nearest the handle, cut a slit one inch tall and three inches long about one inch up from the bottom. 3. Pour about one inch of sand into the container. Shake to distribute sand evenly. 4. Push tea or votive light into the middle of the sand. Use fireplace matches to light. Cost for 8= $1.00 or less. These are very unusual luminary. They don't blow over or get snuffed out if it's wet and windy. They give a lovely white light. At a cost of 10 cents each, they are a very inexpensive way to decorate the outdoors at Christmas and other times of the year. Care must be taken to place the tea light near the center of the container but not directly under the spout. While we haven’t done this as a Pack, I’ve seen it done at local businesses and churches. Each child/family is asked to bring in a pair of mittens, a scarf, and/or a hat to hang on the tree in the meeting area. After the meeting, the donations are packaged and given to one of the local clothing banks or other clothing distribution facilities. Directions: Cut the center of the cardboard out to create the wreath base. Punch a hole near the edge and tie a loop of yarn through it to be used for hanging later. Pour glue out on a recycled meat tray. Put the popped corn into a bowl, and one at a time dip in the glue and stick onto the wreath base. Cover the base completely with the popcorn. Decorate with tiny yarn or ribbon bows, glued on here and there. Directions: Fold a. piece of construction paper in half to form a card. Trace cookie cutter onto sandpaper and cut out shape. Sprinkle cinnamon on the sandpaper, and rub in with your finger. Shake off the excess spice. Glue the cookie shapes on the front of the card. Write your holiday message inside the card. Mail to someone special. Cut strips of construction paper or patters from construction paper (see guide). Connect each one to the previous one by gluing additional circles until a long chain is completed. Length depends on the Scout’s attention span. These ideas do not require gluing. Challenge Scouts to invent their own shapes for a chain. Use the chains to decorate for your pack meeting. On the first day of Cubbing, my CUBMASTER gave to me, a BOBCAT BADGE FOR ALL TO SEE . Directions: Place gumdrops on table. Stick a toothpick into each gumdrop. Press toothpicks into Styrofoam cone. Cover the cone completely. Tie ornaments are edible. Directions: Pour tempera paint over several layers of paper towels on tray to form an inkpad. Dip sponges into paint. Tamp onto paper. When dry, use as gift-wrap. Directions: Find a nicely shaped tree branch on the ground. (Do not cut a live branch). Place it in a pot. Secure it in a piece of Styrofoam or bed of small rocks. Cut a piece of fabric large enough to cover the top of the pot. Cut a hole in the center and slash to the outer edge. Use it as a tree skirt. As the Christmas season progresses, decorate with ornaments you have made. Directions: Cover cups with foil. Punch a hole in the bottom of each and string a ribbon through the hole, securing with a knot. Tie a jingle bell (or two) at the other end of the ribbon. Hang from Christmas tree. 1. Glue one clothespin at each of the 6", 12", 18", 24", and 30" marks. Use either wood glue or hot glue depending on your needs. Body of pins should line up on the centerline of the stick. Jaws should line up with numbers. 2. Paint a funny face on each pin. 3. Clip a baseball cap at each pin and hang on wall. Less than $1.00 apiece. Frequently local merchants will donate the measuring sticks, so cost drops to 15 cents each. Very popular with boys because it is both practical (holds five baseball caps) and fanciful (chomping monster faces). These can be very quick to make if no decorating is done. Some boys will really get into painting and decorating the faces so allow time for it. Be sure the pins are glued down so that jaws are at opposite end of stick from the hanging hole or the chomping monsters will be hidden by the caps when the stick is hung on a wall. These make great craft sale items. Directions: Put the pinecones on a sheet of newspaper. Spray the cones on one side. Allow them to dry, then spray the other side. When dry, paint the tips in gold or silver and let dry. If cones are "soft', sew a foot-long heavy thread through the bottom of each cone. If they are wooden-like, tie a ribbon through the bottom spurs of each cone. Now, you have ornaments for packages, a wreath, a Christmas tree, or to hang on a door with a big bow. Directions: Mix the flour, salt and water to make flour clay. Rub your hands with flour and knead the mixture for at least five minutes, until thickened. Mold and shape the clay into Christmas wreaths, trees, stars, or whatever you like. For adding details, try using a toothpick to "etch" the clay. Finished pieces should be no thicker than 1/2 inch and no bigger than 3 inches. For a hanging hook, stick one end of a paper clip into the shape. Cover a cookie sheet with foil, and place your clay shapes on it. Bake in an oven at 350 degrees for about 12 to 20 minutes. When done, your clay will be light brown in color. When tapped with a fork, it will make a solid ringing sound. Decorate your clay ornaments with paints. When paint is dry, spray the ornaments with clear plastic coating. Tie a thread through each paper clip and hang them on your tree. Directions: Select pictures, designs or greetings that would make attractive gift tags (make sure there is no writing on the back). Cut the tags into different shapes and sizes or make small folders. Punch a hole in the corner of each tag. Cut a 5" piece of string, loop it through the hole and knot. There is something magical about snow, the way it blankets fields, and rests on tree branches; the way it softens a landscape, and quiets a city. 1) Use a regular size flat clothespin. 2) Cut legs" of clothespin off with coping saw. The legs will not be used. 3) Sand & stain or paint the clothespin head light brown. 5) Glue on 7mm wiggle eyes. 6) Trace antler pattern onto brown felt. 7) Cut out & glue on a 6mm red faceted plastic bead for-nose. 8) Draw mouth with fine line black felt tip marker or paint pen. Glue plastic drapery ring on back for tie slide. ü Cut seven six inch squares of aluminum foil. ü Put bottle caps on each square of foil, and mold each to look like a cup to hold a candle. ü Then place each foiled cup on the piece of wood, evenly spaced, then glue each. ü Then place one black candle in the center holder, with three red candles to the left of the black candle, and three green candles to the right of the black candle. ü Press the aluminum tight to hold the candles in place. « Put 3 cups of uncooked white rice in a metal bowl. « Drop food coloring on the rice. « Stir the rice with a metal spoon to distribute the color evenly throughout the rice. « Clean and dry eight baby food jars (or jars of about the same size) and one taller jar and their lids. « Fill each jar to with in 3/4" of the top of the jars. « Push a menorah candle into the rice in each jar. « Arrange the candles on the table with the taller jar in the middle. Menorah odd piece of wood (oblong); bottle caps, wooden spools, etc., paint, glue. Must have 9 holders, one either larger elevated as the "Shammas. Stained Glass Windows waxed paper, shapes of tissue paper (can also be done with Christmas colors and symbols). Iron Hanukkah shapes between two pieces of wax paper. You need two large coffee cans. Clean and dry them. Get your Den Leader to help you make two holes in the can, one on one side and then one on the other. Then you do the same with the second can. Run the end of a rope into one hole and then the other end through the other hole on one of the cans. Get help to measure how long the rope should be according to how tall you are while your standing on the can. After you have the length you need tie the two loose ends together inside the can. Cut off any excess rope. Repeat for other can. Now you have stilts to walk around on. Lots of fun. Santa's reindeer will be hungry when they get to your house. While Santa's inside eating the cookie and milk you left him, the reindeer will be waiting outside. How about leaving them some reindeer food? If you live in an area where you have lots of animals like pets or wild animals they might get to the reindeer food, before the reindeer and they might eat it. Glitter might hurt real animal stomachs and Santa's reindeer will still enjoy the feast without glitter. ü In a Ziploc bag, put a little bit of uncooked oats and glitter. ü Place this poem inside the bag and hand out. With his Christmas Eve flight. Directions: Cut a 1" square of foam and glue to center of foam base. Push four peppermint sticks into the foam to one side of the center. Push four peppermint sticks into the other side. Push the central peppermint stick into the center. On the first day of Hanukkah, "light" the Shamash and the first "candle" on the right. To light the candles, dab some frosting onto the top of the candy stick and attach a candy kiss. Candles are lit from right to left. On the eighth day, the edible parts of the menorah may be eaten in celebration of the holiday. Many Families have traditions surrounding ornaments and decorations for the holidays. Have the boys in your den or pack share their traditions with each other. Here are some ideas that you can share with them. Decorate the tree with a chain made by pushing a needle and thread through pieces of popcorn. Easier still thread string or yarn through items with a hole already in it such as Cheerios, Fruit Loops. or Apple Jacks. Noodles of various types can be dyed with food coloring, painted or used as is to make an interesting chain. Boys love counting down the days left to Christmas. 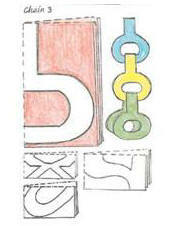 A simple count down chain can be made by gluing or taping strips of paper though each other to make a chain. Use a strip of paper for each day needed for the count down. The chain can be attached to a paper that is decorated to represent the holiday. Here is a fat, jolly Santa made from egg cartons, cotton, and paint. Cut out four of the eggcup sections below the portion of carton which joins one cup to another so that you have only the round bottom half. Color three of the cups red on the outside with poster paint or crayon and one white. Glue two of the red sections together where they have been cut. Glue the third red section on top of the white one, again joining at the cut part. Twist some cotton into a thick cord and glue this around the seams you have made on the cups for the trim on Santa’s hat bottom jacket trim. Make a tassel for his hat, hair and whiskers out of cotton. With paint or crayon color his eyes, nose, mouth and buttons for his coat. Glue the two halves together. Planning a big Pack Christmas (or other Holiday) event? Don’t know what to do with all those cards?? Need a skit or puppet play? ?